Alright, so we have an Aviom system (which is awesome BTW) at the church I play at as well as the typical wedges so everyone has access to in-ear monitors if they so choose (bass players don’t get an option). So I’ve been using IEMs for 5 years or so now. When I first started out, I tried some M-Audio IE-30′s (same as Ultimate Ears Super.fi 3′s) and all I could say was, “Meh”. I was playing bass at the time and they were pretty weak in the old bass department and I thought they only sounded average. I was getting over not being able to play bass with an amp so I went out and got some V-Moda Bass Freq’s which ended up working quite well for playing bass other than that at the time I bought them, they had gone on sale and the only color left was hot pink… No worries, don’t care that much about looks and went on. They weren’t technically IEM’s, but they worked and they fit well enough to mostly stay put as long as movement was kept pretty minimal. Unfortunately, they broke and I took a bit of a sabbatical from playing to work more behind the sound desk. However, lately my amount of playing has been ramping up, but on a mix of keys, bass, acoustics, and vocals. I had been using some cheap isolating headphones because I decided that the next set of IEMs were going to be decent ones. However, we were playing for a conference and I was hating how my voice was sounding through my these cheap phones and wasn’t sure if it was the headphones, my voice, or something in the EQ. I was getting some new strings in the music shop just before practice on the opening night and saw these sitting there. I instantly had a good feeling about them and thought I should get them. I used to be a very big impulse buyer, but recently I have learned to control myself and go home to research things before purchasing. I knew I wouldn’t likely be able to return them because of the whole hygenic concerns, but I went for them anyway. Boy, was that the best decision I’ve made in a while. I start unpackaging them and one of my biggest beefs with the M-Audio IE-30′s was that they were bulky, stuck out a ways, and I had trouble getting a good fit. With these, they come with a multitude of tips including some awesome memory foam ones (different that the typical yellow foam) as well as a triple-flange tip. Both are great and really help them stay put. They also are very, very light and small. This help keep them from moving around too much when you do as well as you don’t look stupid having radio antennas coming from your ears. They come in a nice, little semi-hardshell case that will keep them safe. On to the sound. Wow. 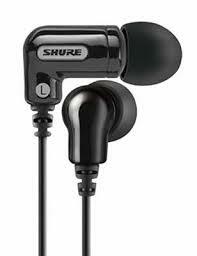 From what I had remembered of the IE-30′s, I thought I was going to get a similar, thin, weak sound. However, these were different. They will not overwhelm you with their bass content, but for a single driver, they reach far enough down to hear the bass and kick with decent impact (which is likely due to the excellent tips providing the right fit which is key to getting good bass). I was on bass at the time, and although I wouldn’t have minded a bit more bass, I was satisfied because it wasn’t muddy and I could hear all the mids and highs of the bass very well. However, the part that impressed me the most was the clean, balanced mids and highs. They don’t sound too hyped – just smooth and pleasant. They reach high enough to pick up the air on my mic while still providing the other content of the mix. Their imaging is also excellent as the Aviom systems are stereo and you mix your pan width. I was able to place things really well and thoroughly enjoyed what I was hearing. The detail isn’t off the charts like a $1000 pair of phones, but there is plenty – especially in comparison to anything consumer based. I’ve now used them while playing keys as well as guitars and I’m definitely happy with them. One thing that is important with IEMs that isolate well is how your voice responds through them because it’s always a mix of what you hear in your head (like when you plug your ears and sing) and what comes through the headphones. If they have too much bass content and not enough highs and mids, it’ll throw you off. These IEMs don’t have the semi-moldable cables on the last couple inches before the headphones which would allow you to create a semi-rigid hook to go over your ear. I miss having that, but the cable is starting to form into that shape. I could use the trick of a paper clip and electrician tape, but they stay put pretty well anyway. The replacement foam and memory foam tips are fairly expensive to replace, but they do last a while. I’ve recently starting using the triple-flange tip which doesn’t need replacing and the fit is good. However, they do stick out a bit farther when you use this one. They aren’t uber comfortable because they aren’t molded, but they’re not bad. Could be more detailed. Overall, for $145, this was a great buy. Sure, it would have been nice to get some custom molds, but for the price, these have served me very, very well so far. I like the case they come in as it’s compact, but strong. The cable is almost 5 feet long which is a nice length. Tons of tips so you are bound to get a good fit. If you don’t have tons to spend, these are a great option. I caught these as Musician's Friend's "Stupid Deal Of The Day" for *49.99* a set, and at that huge price drop I didn't mind that it was only the white models. I grabbed a set for myself as well as the Wife, and while I haven't had the chance to use them as IEMs (that may come soon, however, as I might have a subbing gig for a good deal of 2012, simply as iPod earbuds they blow all the competition away anywhere close to that pricepoint. I'd even say that when you've found the tips that fit *you* the best, they come startling close to my Audio-Technica ATH-M50 Headphones, which are IMO the most underrated headphones under $250. Yeah, you're right about them blowing away iPod headphones. It's crazy to me how many people still use the iPod ones - they're terrible. Really terrible. Some of the key to good sound is isolation which these do pretty well. Now, you should step up into some JH Audios and fall in love again :).